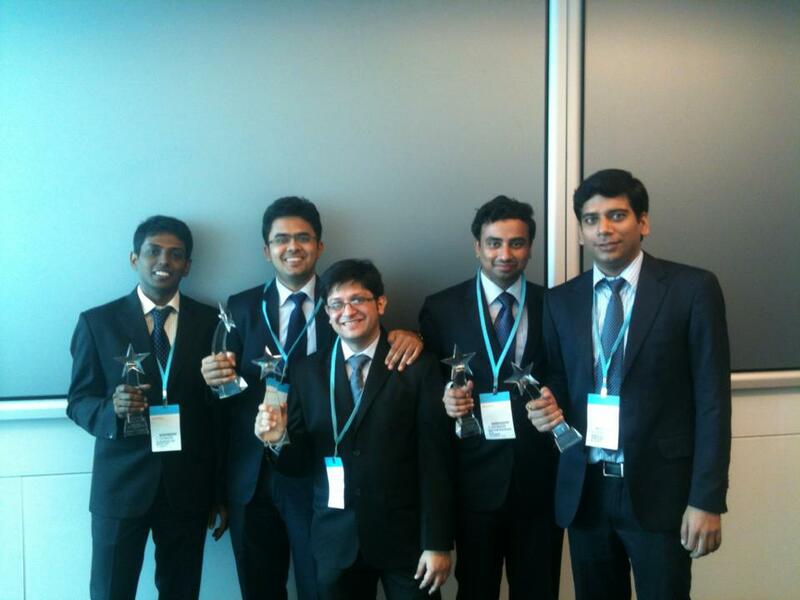 National Institute of Industrial Engineering (NITIE), Mumbai has emerged as the winner of the CFA Institute Research Challenge India West Zone Final (www.iaipirc.org). The team from NITIE triumphed over the teams from Jamnalal Bajaj Institute of Management Studies, Narsee Monjee Institute of Management Studies , S.P. Jain Institute of Management & Research, K.J.Somaiya Institute of Management Studies & Research and Shailesh J. Mehta School of Management, IIT Bombay. The team members comprised Ankur Pant, Prakash Sethu, Ankush Chutani, Gunaseelan Maniyan & Shyam Sundar. Indian Association of Investment Professionals (IAIP) organizes the research challenge across five zones with 43 business schools participating. The winners of these zones will compete at the National level from where the winner will represent India in the Asia Pacific regional challenge. “The teams have put in a lot of hard work and exhibited sound financial analysis and research capabilities in conducting research on the subject company – Zee Entertainment Enterprises Ltd. It is satisfying to see students receive mentoring from industry expert Mr. Nilanjan Das and professional research analysts as they analyze a publicly traded company. They have put in dozens of hours to write a professional research report, and present their recommendations to a high-profile panel of experts.” said Kishor Bagri, CFA, Director, IAIP. The eminent panel of judges were Jayesh Gandhi, CFA, Executive Director, Morgan Stanley Investment Management; Neelkanth Mishra, India Equity Strategist, Credit Suisse, and Amit Khurana, Director – Research, Dolat Capital. The competition is supported by National Stock Exchange (NSE) (www.nseindia.com), Bloomberg (www.bloomberg.com) and FitchLearning (http://www.fitchlearning.com) as sponsors and long-term corporate partners. CFA Institute Research Challenge is an annual, global educational initiative promoting the best practices in equity research among the next generation of analysts through hands-on mentoring and intensive training in company analysis and presentation skills. Introduced in 2006, CFA Institute Research Challenge is considered as “the investment Olympics” for university students, with more than 10,000 students having participated. This year, more than 3,500 students from 775 universities worldwide will participate in the local rounds of the competition.